Schematic diagram of NIST vacuum sensor design. Many semiconductor fabricators and research labs are under increasing pressure from, of all things, vacuum. These facilities need to remove greater amounts of gas molecules and particles from their setups as new technologies and processes demand lower and lower pressures. For example, the vacuum chambers in which microchip manufacturers lay down a series of ultrathin layers of chemicals step by step--a process that must be utterly free of contaminants--operate at about one hundred-billionth of the air pressure at sea level. Some applications need pressures at least a thousand times lower than that, approaching the even more rarefied environments of the Moon and outer space. Measuring and controlling vacuum at those levels is an exacting business in which accuracy is essential. Current technology usually relies on a device called an ion gauge. However, ion gauges require periodic recalibration and are not compatible with the new worldwide effort to base the International System of Units (SI) on fundamental, invariant constants and quantum phenomena. 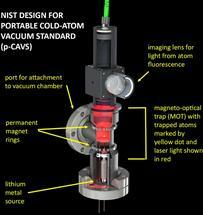 Now NIST scientists have designed a vacuum gauge that is small enough to deploy in commonly used vacuum chambers. It also meets Quantum SI criteria, meaning it requires no calibration, depends on fundamental constants of nature, reports the correct quantity or none at all, and has specified uncertainties that are suitable for its application. The new gauge tracks changes in the number of cold lithium atoms trapped by a laser and magnetic fields within the vacuum. The trapped atoms fluoresce as a result of the laser light. Every time a cold atom is struck by one of the few molecules moving around in the vacuum chamber, the collision kicks the lithium atom out of the trap, decreasing the amount of fluorescent light emitted. A camera records the dimming. The faster the light dims, the more molecules are in the vacuum chamber, making the fluorescence level a sensitive measure of pressure. 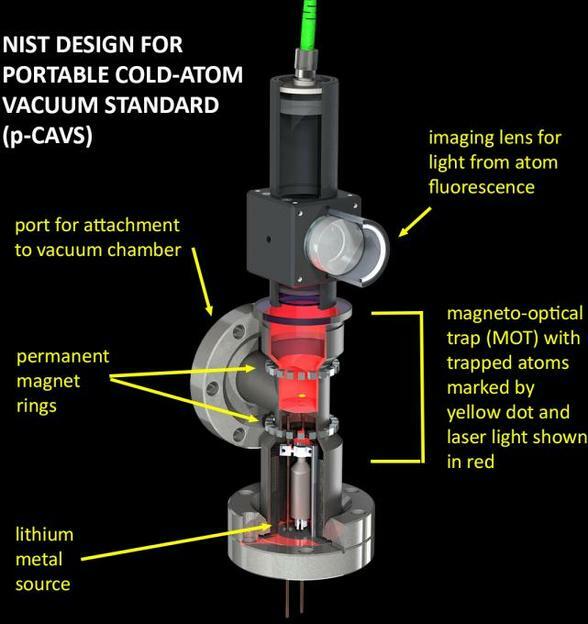 The new portable system is the result of a NIST project to create a tabletop cold-atom vacuum standard (CAVS) that will be used to make measurements of fundamental atomic properties. While CAVS is too large for, and unsuited to, use outside the laboratory, the portable version, or p-CAVS, is designed to be a "drop-in" substitute for existing vacuum gauges. "Nobody has thought about how to miniaturize such a cold-atom vacuum gauge and what kinds of uncertainties it would entail," said Stephen Eckel, one of the project scientists. "We are in the process of developing such a system that could potentially replace sensors now on the market, as well as figuring out how to operate and evaluate it." Individual components are being tested, and a working prototype is expected in the nearfuture. The NIST design uses a newly developed variation on a staple technology of atomic physics: the magneto-optical trap (MOT). In a typical MOT, there are six laser beams--two opposing beams on each of three axes. Atoms placed in the trap are slowed when they absorb momentum from laser photons of exactly the right amount of energy, damping the atoms' motion. To confine them in the desired location, the MOT contains a varying magnetic field, the strength of which is zero at the center and increases with distance outward. Atoms in higher-field areas are more susceptible to laser photons and are thus pushed inward. NIST's portable gauge uses only a single laser beam directed onto an optical component known as a diffraction grating, which splits the light into multiple beams coming from various angles. "Putting in laser beams from six different directions makes the experiment really big and needs a lot of optics," said Daniel Barker, another NIST project scientist. "Now you only need one laser beam that comes in and hits a diffraction grating. When the light is diffracted you get the other beams that you need to close the MOT and make the trap." At that point, the atoms are only a few thousandths of a degree above absolute zero. They are struck by ambient molecules, principally hydrogen--the dominant gas that remains after the vacuum chambers are baked and then pumped down to ultrahigh (UHV) or extreme-high vacuum (XHV). The UHV range includes the vacuum level around the International Space Station; XHV includes the even lower pressure levels above the Moon. The use of lithium is another scientific innovation in the NIST design. Lithium is the third-lightest element and belongs to the group of alkali metals--including sodium, potassium, rubidium and cesium--which are comparatively easy to cool and trap. "Nobody to our knowledge has been thinking about a single-beam MOT for lithium," Barker said. "Lots of people think about rubidium and cesium, but not too many about lithium. Yet it turns out that lithium is a much better sensor for vacuum." Among the advantages: The interaction dynamics between lithium atoms and hydrogen molecules can be calculated exactly from first principles. "That allows us to make a primary gauge that you don't need to calibrate," Eckel said. "Moreover, lithium has an extraordinarily low vapor pressure at room temperature (meaning it has a low tendency to change into a gaseous state). So, typically, the atom will make a single pass through the MOT region and if it is not trapped it will hit a wall and stay there forever. With rubidium or cesium, which have relative high vapor pressures at room temperature, eventually you will coat the walls of the vacuum chamber with enough rubidium or cesium metal that the coatings will start emitting atoms. "In addition, lithium's vapor pressure also remains low at 150 degrees Celsius, where people generally bake UHV and XHV chambers to remove water coatings on the stainless steel components. In that sense, you can still prepare the vacuum chamber through standard techniques, even with this gauge attached." UHV and XHV environments "are a critical part of the infrastructure in advanced manufacturing and research, from gravitational-wave detectors to quantum information science," said James Fedchak, who oversees the project. "CAVS will be the first absolute sensor created that operates in this pressure regime. At present, engineers and scientists often use the experiment or process itself to determine the vacuum level, which is often a destructive test." "p-CAVS will enable researchers and manufacturers to accurately determine the vacuum level before the experiment or process begins," said Fedchak. "It will also allow lower levels of vacuum to be accurately measured--levels which are becoming more and more important in areas such as quantum information science."